Don’t waste any time, You are invited to join the celebration of wind and water in one of the greatest part of world. Here you will have a chance to visit one of the most beautiful masterpieces of nature. After your arrival at Shiraz International Airport you will be taken to your hotel to check in and relax after your long flight. Overnight stay in Shiraz. Full day excursion to Persepolis, Naghsh-e-Rostam and Naghsh-e-Rajab for visiting a breathtaking attraction in 50 km north of Shiraz.i.e. a must –see site for not only history buffs but also everyone who like to know more about the history of Persian Empire. we will continue our way to visit the Capital of ancient Persia and the Tomb of Cyrus the great that without doubt is one of the most respected Persian Emperor both in national and international view (It is located in 87 km of Shiraz). Overnight stay in Shiraz. Drive to Kerman, enroute visit the Sassanian Palace at Sarvestan and the biggest fig garden of the world, overnight stay in Kerman . Full day excursion to Rayen to visit the Adobe castle of Rayen (The Arg-e-Rayen) and believed to be at least 1,000 years old; Enroute visit The shrine of an Iranian mystic and poet.i.e. Shah Nematolah-e Vali Shrine, and the Prince Garden at Mahan; overnight Kerman. Half day visit of Kerman to see the Ganj-Ali Khan Complex -This complex with an area of 11000 square meters belongs to Safavid era composed of Bath, Bazaar, Caravanserai, Mosque and Square), Friday Mosque; Then Drive to Saryazd that some historians believe it had been the old part of Yazd. Its castle which goes back 1700 years is one of the significant monuments of this village. Its restoration has been honored with an Award of Distinction in 2014. overnight stay in Saryazd. In the Morning and after spending some hours in Beautiful Saryazd; drive to Yazd, one of the oldest cities on earth and a stop on the ancient Silk Road. The center of Zoroastrian culture and Persian architecture, Yazd has many interesting and beautiful sites. You will see the Zoroastrian Towers of Silence and Atashkadeh Fire Temple, the Jame Mosque with its towering twin minarets that dominate the surrounding city and the Dowlat-Abad Gardens, one of Iran’s most beautiful gardens and a UNESCO World Heritage Site. Visit the impressive Amir Chakhmagh complex and Lariha House, one of the best-preserved traditional houses from the Qajar era. Marvel at the clever wind towers and water irrigation systems invented by ancient engineers and architects to make living in the hot, arid desert manageable. Overnight stay in Yazd. Drive to Tabas. The bride of desert with its beautiful attractions such as Golshan Garden that is like a dream in them idle of desert, Kerit Dam ,Morteza Ali spa and Kal Jenni , Overnight stay in Tabas. Drive to Mesr village , visiting Salk lake, Safari and Playa canals . Overnight stay in Mesr . In the morning and after breakfast we Drive to the city that has been recognized by UNESCO as a world heritage and contains a wide range of Islamic Architectural styles ranging from the 11th century (to the 19th and start a memorable city tour by visiting palace of forty columns or Chehel sotun belongs to Safavid era and has very beautiful mural paintings and a pretty Persian garden, the world heritage site of Naghsh-e-Jahan Square (Imam & Lotfollah mosque, Ali Qapu Palace). this square has been surrounded by two beautiful mosques and old bazaar of Isfahan and can entertain you for couple of hours ; then walk along the Zayande rood river and Isfahan famous ancient bridges (si-o-se pol & Khadju). Overnight stay in Isfahan. Full day city tour of Isfahan to visit the magnificent Jame Atiq Mosque. It is 14th registered world heritage sites of Iran in UNESCO and one of the oldest mosques of Iran that dates back to 8 century. Ali Gholi Agha Complex and if you like to visit a place that represent you one of the most remarkable examples of eccentricity in Persian architecture continue our tour by visiting Pigeon Towers, this towers belongs to Safavid’s time. In the afternoon and before transferring to airport for flight to Tehran we will visit the third most important Safavid palace.i.e. The Hasht-Behesht palace and Vank cathedral, overnight stay in Isfahan. Drive to Kashan enroute visiting Abyaneh. Abyaneh is a village near Kashan that is registered with UNESCO as a heritage site. The red mud-brick buildings, people in traditional clothes (women with white long scarf and under-knee skirt and men who wear a long garment and a pair of loose canvas pants) and special unique architecture has made this village unique; after spending a couple of hours there we will move toward the edge of the central deserts of Iran and town of Kashan to visit Tappeh-ye Seyalk, Fin Garden, Tabatabaiha & Broojerdiha house, overnight stay in Kashan. Visit the Kashan Bazaar and then drive to Maranjab; overnight stay in Maranjab. 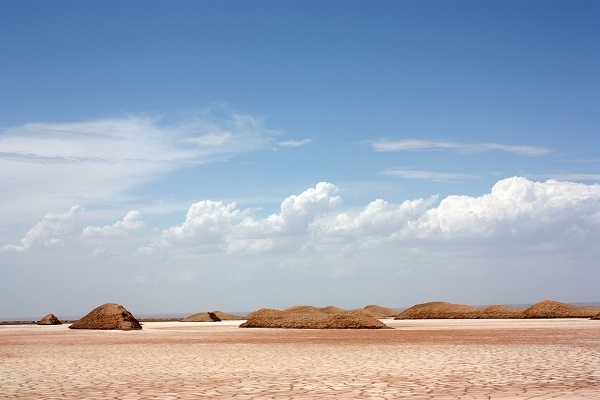 Visit the salty lake and sandy hills, the Sheikh Rabi Caravanserai and the Ghasr-e- bahram in Maranjab; overnight stay in Tehran. Transfer to Imam Intl. Airport for your departure flight.